This month’s eight-hundredth anniversary of the sealing of Magna Carta provides a good opportunity to examine the painting of the event that hangs in St Stephen’s Hall, and the forgotten controversy that surrounded its creation. Occupying one of eight panels in the room built by Sir Charles Barry on the footprint of St Stephen’s Chapel, the picture forms part of The Building of Britain series completed in 1928. The last major decorative scheme undertaken in the new Palace of Westminster, this series consists of scenes of significant national events from the time of King Alfred until the union between England and Scotland in 1707. The project to decorate St Stephen’s Hall in the 1920s was spearheaded by the Speaker of the House of Commons, John Henry Whitley. For The Building of Britain, the poet and historian Sir Henry Newbolt suggested the subjects, while Sir David Young Cameron, serving as ‘master-painter’, was tasked with selecting eight artists and overseeing their work. It was to portrait and landscape painter Charles Sims that Cameron entrusted portraying the sealing of Magna Carta. The subject itself was perhaps an obvious choice for the decoration of Parliament, and had in fact featured in unrealised plans for St Stephen’s Hall drawn up by the Prince Albert-led Fine Arts Commission in 1847. Both the FAC and Newbolt/Whitley saw it as being particularly appropriate for the St Stephen’s site, with links drawn between the obtaining of rights and freedoms under Magna Carta and the defence and extension of those liberties on the floor of the old House of Commons chamber. Over the years, the various programmes to embellish Parliament’s home saw their fair share of controversies, with the St Stephen’s Hall series being no exception. The need to remove three paintings from the hall to make way for the new series provoked an outcry early on, and the inclusion of the 1707 Act of Union among the subjects angered Scottish home rulers. But when it came to Sims’ painting, it was not the subject but the artist’s interpretation of it that offended. Following the painting’s unveiling by King George V in June 1927, criticism soon mounted. Critics questioned the historical accuracy of the event as Sims portrayed it, noting that there was no basis for it having occurred during a storm, or for the Papal Legate being injured by a falling Royal Standard, an event that Sims placed in the forefront of the composition. 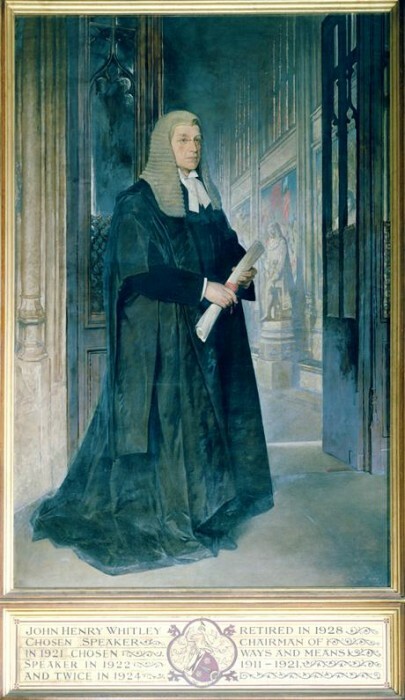 In Parliament, the historian and MP Sir Charles Oman led the charge against the work on both historical and artistic grounds. Oman found the trampling of the Royal Standard in the mud and the inclusion of the figures in the left foreground, which he likened to people from the Stone Age, particularly troubling. For many, including the other artists, the principal issue was the fact that Sims’ painting was out of keeping with the rest of the series. To ensure the scheme’s unity, the artists had agreed to use the same colours, horizon height, scale of figures and perspective distance from the picture plane, taking cues from Michelangelo’s The Entombment in the National Gallery. Sims had completely failed to comply with these conditions. Though there were many detractors, Sims did have his supporters. Percy Harris MP noted that similar complaints had been made about William Blake’s art a century earlier, while the artist Harold Speed declared the painting the best of the series. Having been responsible for supervising Sims’ work, Cameron argued: “The qualities revealed in it are so brilliant and its daring so great that, whether at present cared for or not by critics, it takes its place on the wall as an intense stimulus”. He also warned that attempts to remove the painting would only result in trouble. Despite calls for its rejection, the painting remained in situ. Whitely believed that another artist should be commissioned to produce a replacement but, wary of offending Sims and the donor Lord Burnham, felt that the matter had best be left until the dust settled. Nearly ninety years on and Sims’ painting of King John sealing Magna Carta is a permanent feature of St Stephen’s Hall. Though it still divides opinion, it nevertheless forms a key depiction of this historic national event, while its creation marks an important moment in the history of this significant national site. Further details and images of the other canvases in The Building of Britain series, can be found on relevant the Art in Parliament webpages.